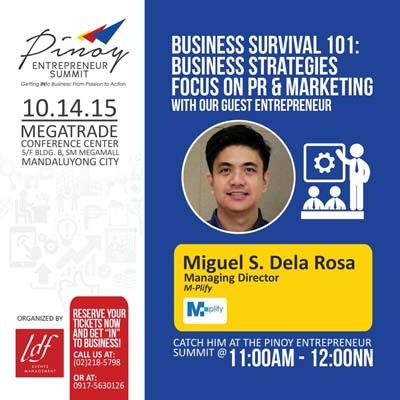 You are all cordially invited to the first ever Pinoy Entrepreneur Summit: Getting Into Business – From Passion to Action on October 14, 2015 (Wednesday) 10:00 AM- 5:00 PM at Megatrade Conference Center, 5/F Bdg. B, SM Megamall, Mandaluyong City, wherein I was invited to be one of the keynote speakers, along with top entrepreneurs in various fields. Pinoy Entrepreneur Summit: Getting Into Business – From Passion to Action aims at imparting ideas and inspiration to young and aspiring entrepreneurs in transforming ideas and passion into more serious business. I personally hope to be able to share best practices in marketing ideas, innovations and trends to bring out the entrepreneurial skills and spirit among the attendees. See you there!